This integration makes contact synchronization set up and 1 click product transfer a breeze. Use the Shopify newsletter software integration to add powerful emailing functionality to your platform. Synchronize your customer data, sales figures and product information automatically from your website. Newsletter2Go takes care of the daily sync’s and empowers you to import product information and photos directly into your newsletter. This feature is every marketer’s must-have tool and a real time saver. 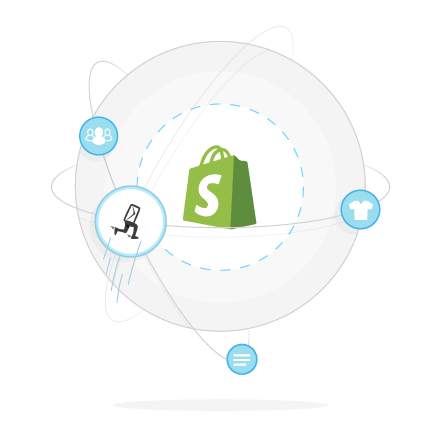 Moreover, it’s easily integrated with the Shopify newsletter software integration. With just one click, you can transfer your entire product description, picture, price and link in your newsletter. Stop copying over individual elements and reformatting everything and focus your marketing efforts elsewhere. For this we will create a customized Premium Newsletter template in your corporate design. This template communicates via the Shopify Newsletter integration directly with your store, so that you can take care of all important product information in your newsletter simply by entering the product number. Note: The contact synchronization with your system is free. To use 1-click product transfer, you will need a one-time premium newsletter template. These can be booked by email at *protected email* or in your Newsletter2Go account. The template creation is, of course, programmed and designed exactly according to your wishes. Learn more about our newsletter tool and newsletter software.